Warm crunchy tortilla shells stuffed with grilled tuna, creamy avocado and sweet red onion. Grab a shallow non-metallic dish, and sprinkle in the Taco Spice Mix, with the oil, lime zest and juice. Toss in the tuna and coat in the mixture. Leave to marinate for 15-20 minutes. Fire up a griddle pan or barbecue to a medium heat and sizzle the tuna steaks, 1-2 minutes each side for rare or 2-3 minutes each side for well done, brushing them with any remaining marinade. Leave them sit for 2 minutes and then thinly slice. Meanwhile chuck the avocado slices, onion, coriander and lime juice in a bowl and mix. Warm the twice cooked crunchy tortilla Shells from the instructions on the box then dish it all up. Get the whole street together for a Mexican feast. 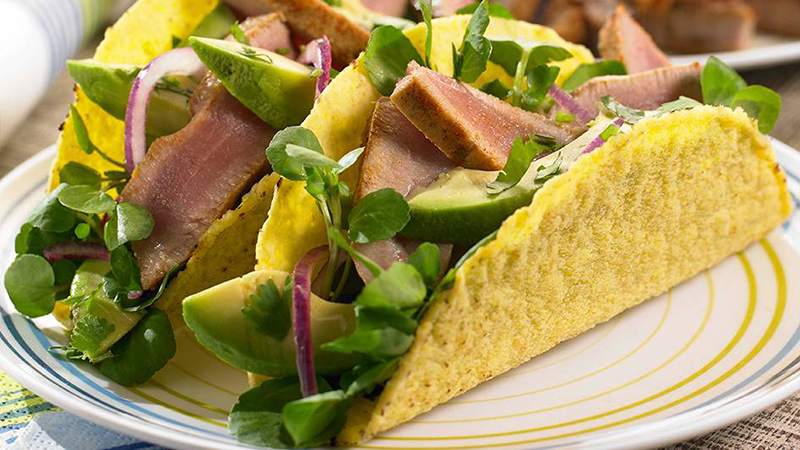 Take a taco Shell and layer it up with some watercress, avocado, red onion mixture and tuna strips. Top with the tangy Original Salsa and a squeeze of lime.